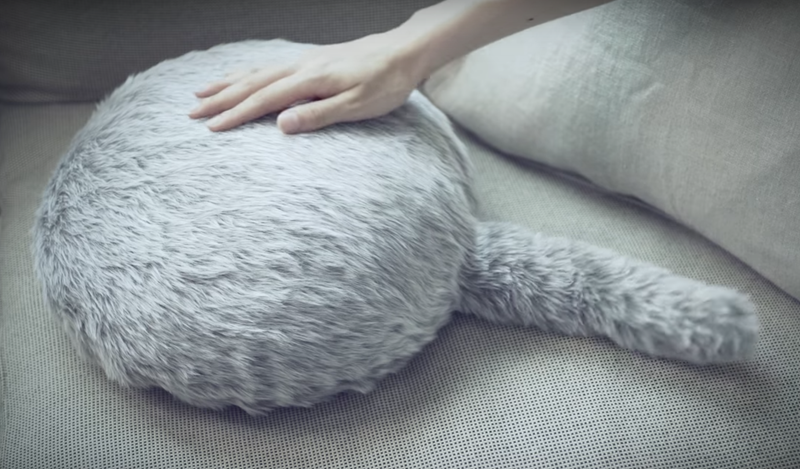 A Japanese company called Yukai Engineering has just unveiled a new product called “Qoobo,” a headless, legless robotic cat pillow that wags. The demo video refers to the item as a “cushion-tailed therapy robot” and “a communication tool that doesn’t require words.” It’s a therapist you don’t have to talk to and a pet you don’t have to love. Perfect for sitting in your bedroom on the verge of tears for hours. It’s basically an animatronic coonskin cap. When it hits the market in June 2018 you may purchase it in either “huskey gray” or “french brown,” for probably about $100, according to Engadget. What we’re talking about here is a cat that has none of the unpleasant features of a cat (causing allergic reactions in some), while maintaining all the best features of a cat (a tail that moves). Soon you will be able to order the Qoobo online very late at night when you are drunk, and you will even be able to order it when you are drunk in the daytime. Cheers.